Staphylococcus aureus causes different types of infections in humans, some of which are lethal. One of its most powerful weapons is α-toxin, which destroys host cells by forming pores in their membranes. Researchers at the University of Geneva (UNIGE), Switzerland, have identified the mechanism that allows these pores to be particularly harmful, by being anchored to contacts sites between cells. 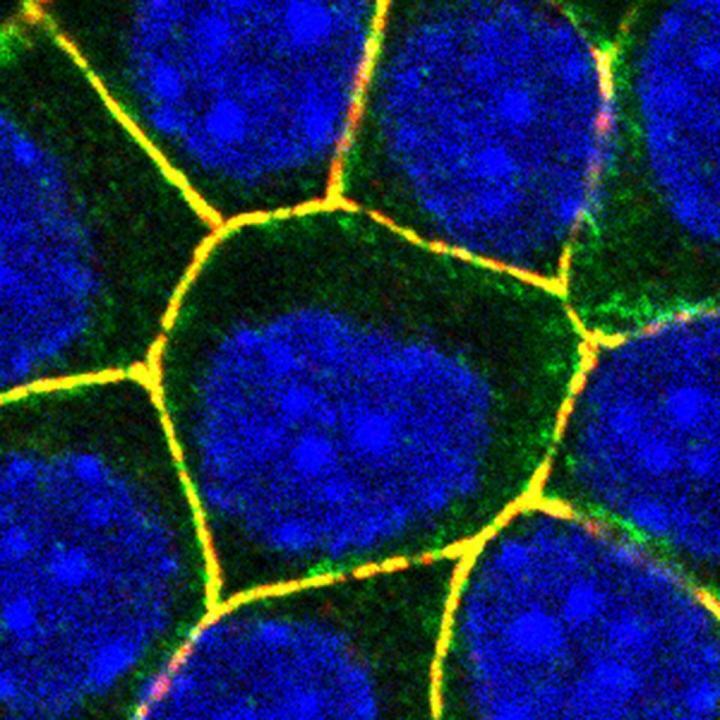 The study, published in the journal Cell Reports, uncovers how different proteins of human cells assemble into a complex to which pores are docked, and then molecularly “locked” to stabilize them. The biologists also demonstrate that blocking the assembly of the complex by removing one or the other of its elements allows pores to be removed from the membrane and cells to survive. Identifying the host’s cellular mechanisms that contribute to the virulence of toxins is essential to develop therapeutic approaches against antibiotic-resistant bacteria. The membranes of our epithelial cells are equipped with adherens junctions, which contribute to maintaining the integrity of our tissues. These junctions are composed of various proteins that allow adjacent cells to adhere to each other and that are internally connected to – and stabilized by – the cytoskeleton. “Three years ago, we discovered that several components of the adherens junctions play a role in the virulence of α-toxin, but we did not understand the underlying mechanisms at work”, explains Sandra Citi, Professor at the Department of Cell Biology of the UNIGE Faculty of Science. What happens when Staphylococcus aureus secretes α-toxin in large quantities near the epithelial cells? In collaboration with researchers from Stanford University and Inserm, the biologists from UNIGE have put together the pieces of the puzzle and uncovered the mechanism. “We already knew that the toxin binds to a cell membrane protein called ADAM10, which causes pores to form and cluster in the same location”, says Jimit Shah, a researcher from the Geneva group and first author of the study. Is there a way to counter the effect of the bacterial weapon? “We have demonstrated that each of the four components of the complex is crucial for the whole mechanism to function. Inhibiting the proper formation of the complex indeed hinders the proper assembly of toxin pores at the adherens junctions”, Jimit Shah adds. The pores formed by the α-toxin outside the junction are easily removed from the cell surface by the cell, resulting in the recovery of the damaged cell and ensuring its survival. Many strains of Staphylococcus aureus have become resistant to antibiotics, and some are even impervious to all existing treatments. “A new potential therapeutic approach could be targeting the complex we discovered. The development of a clinical molecule capable of inhibiting interactions within the complex would likely be an obstacle to the spreading of multidrug-resistant strains”, concludes Sandra Citi.